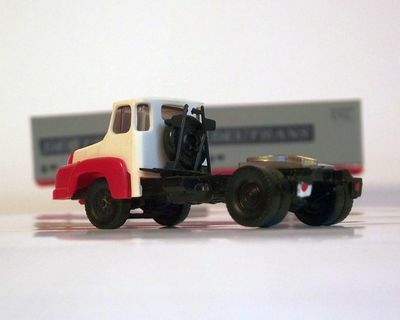 The model W50 was a multi purpose truck built by IFA (Vehicle Industry Association) in east Germany between 1965 and 1990. 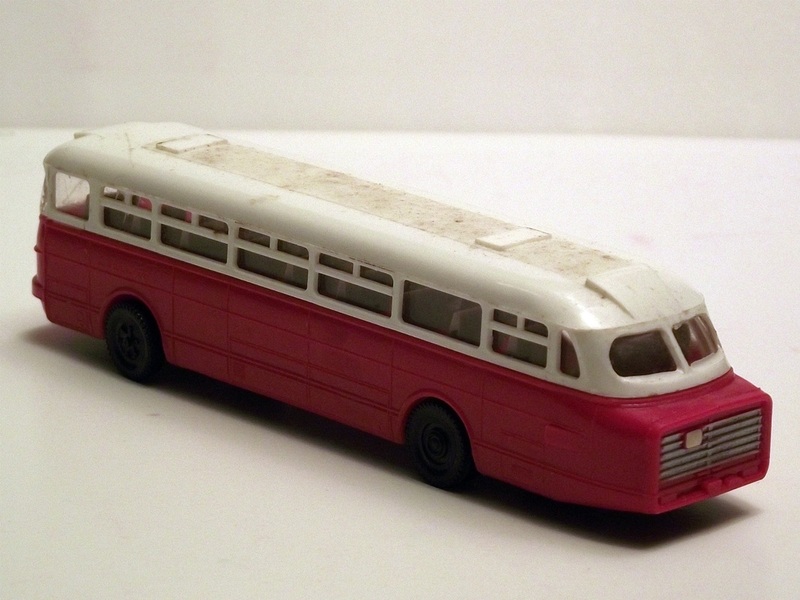 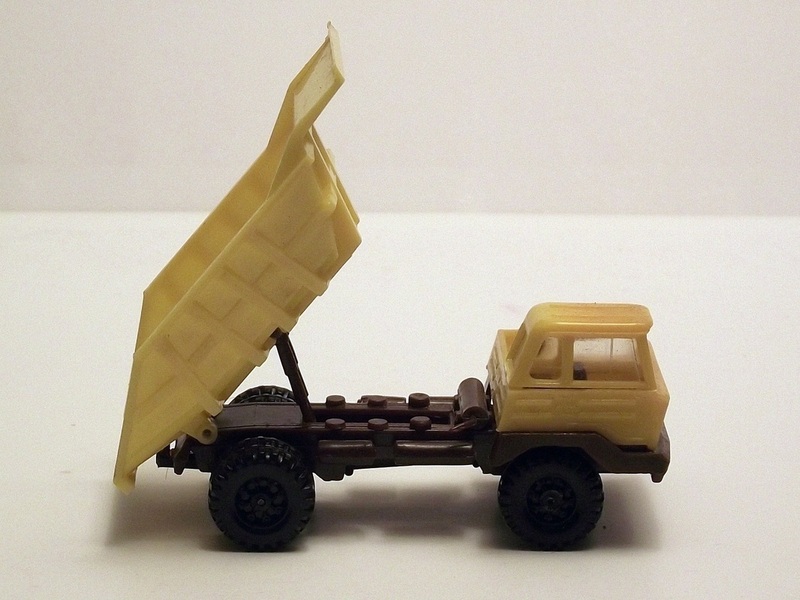 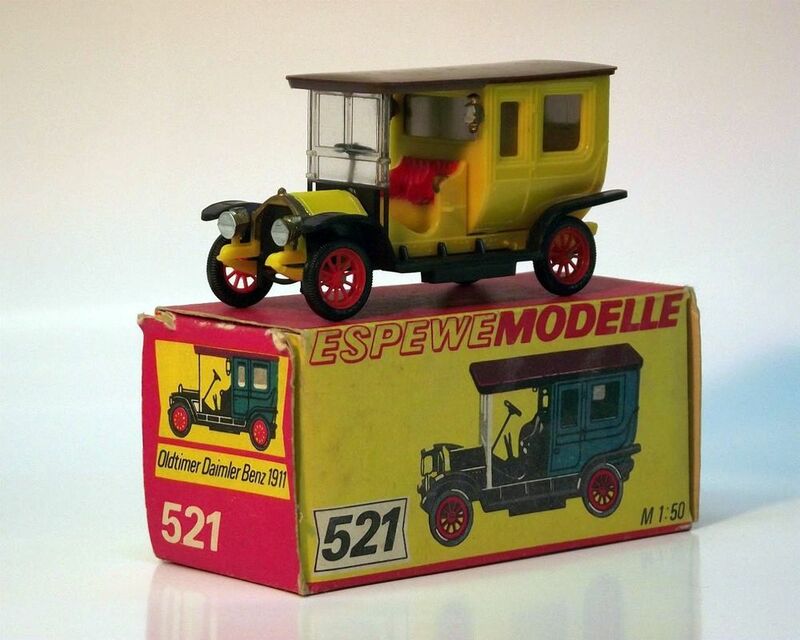 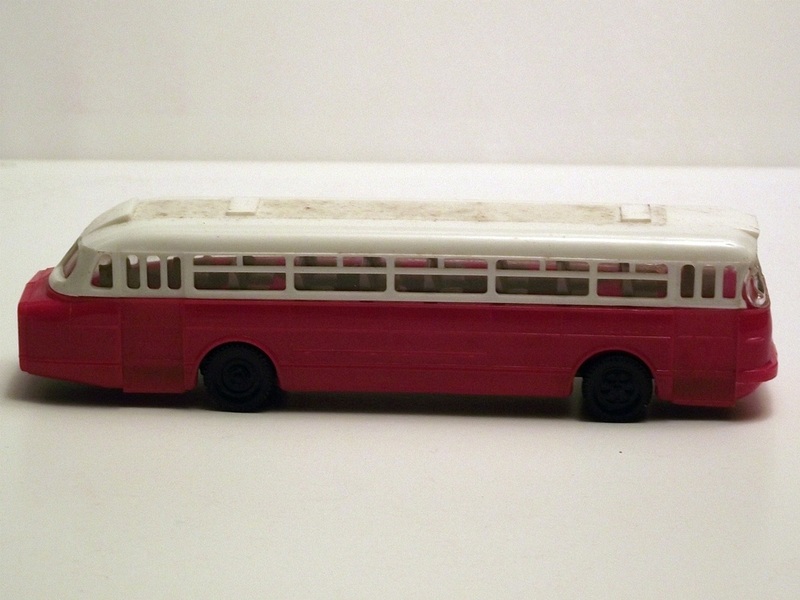 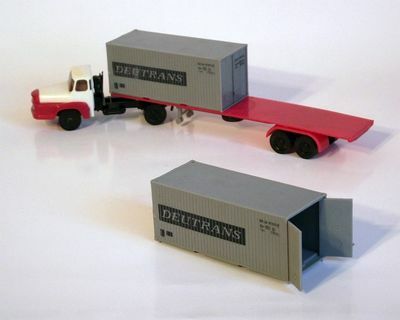 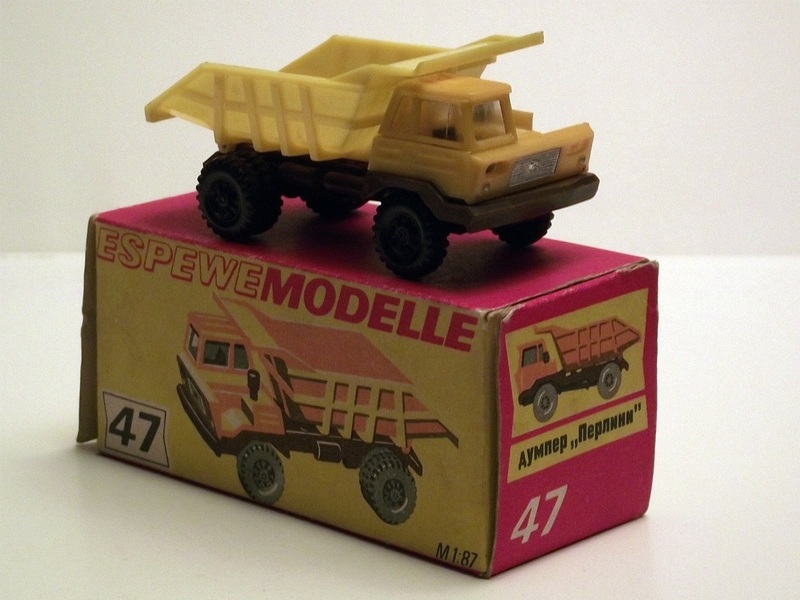 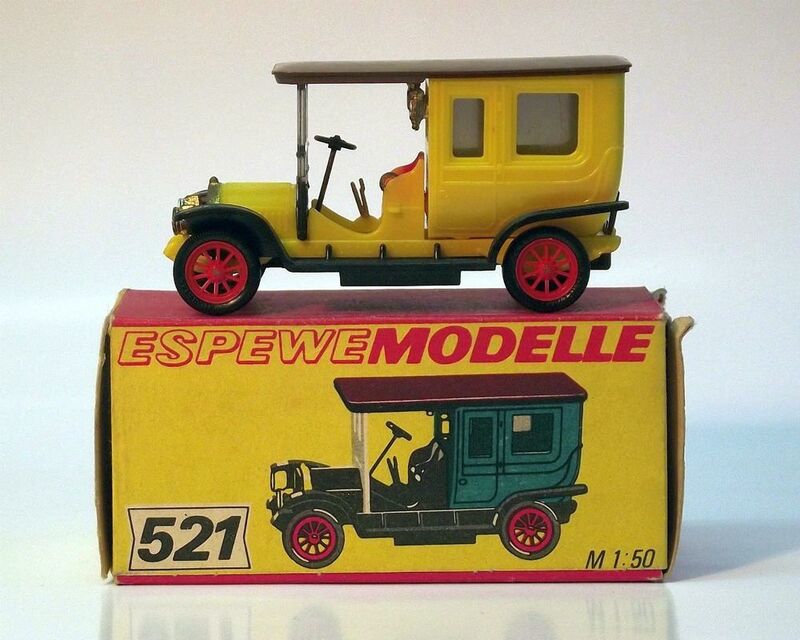 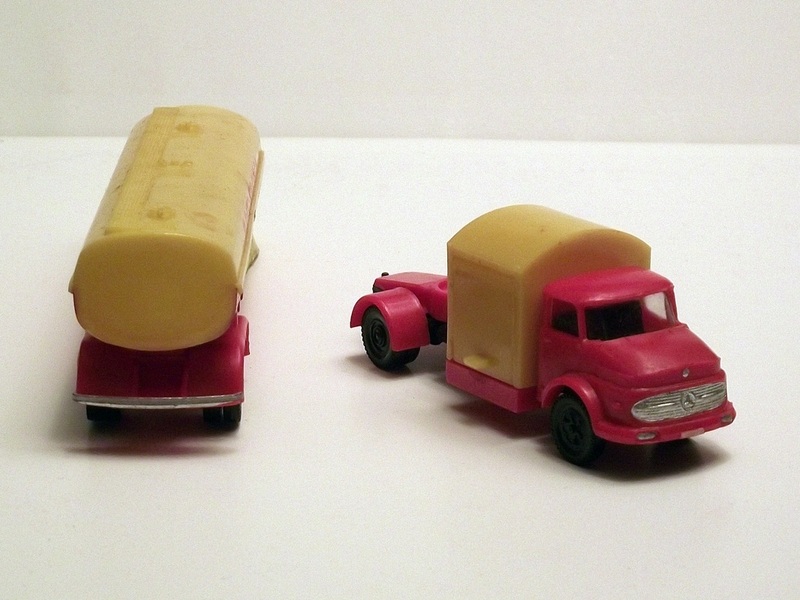 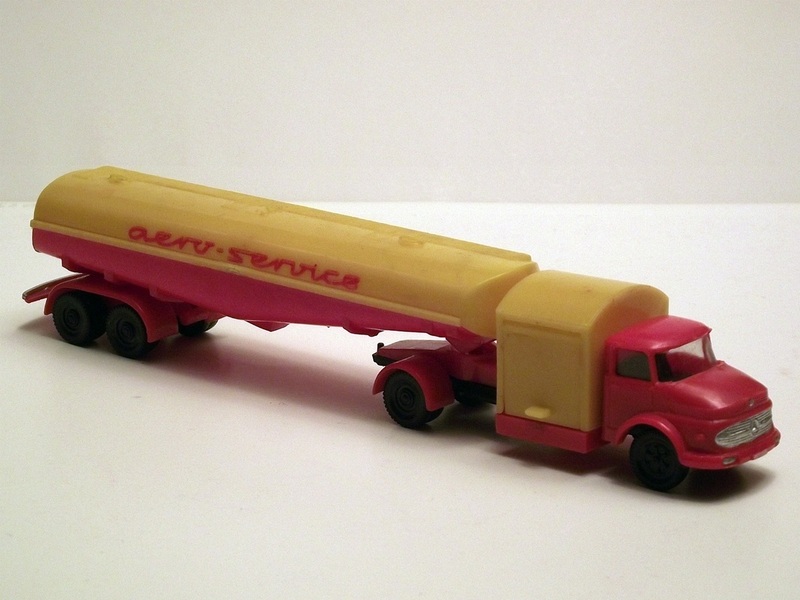 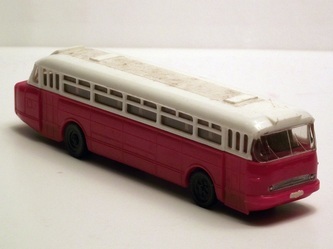 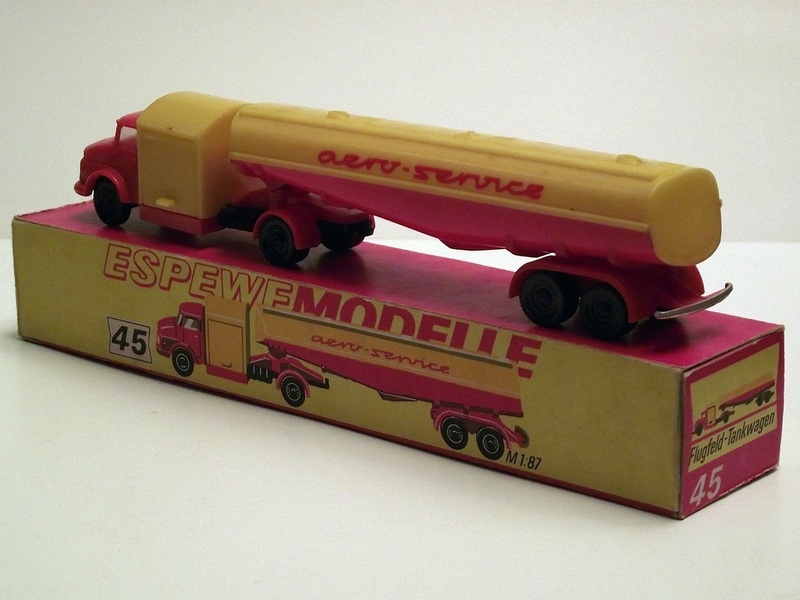 In the pictures there is a 1:87 scale model made by ESPEWE MODELLE from east Germany, produced between 1972 - 1975. 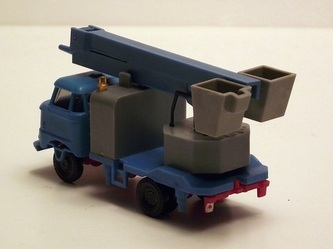 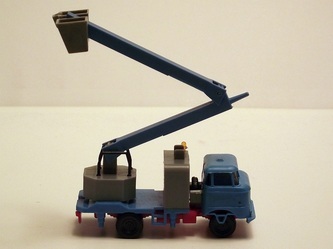 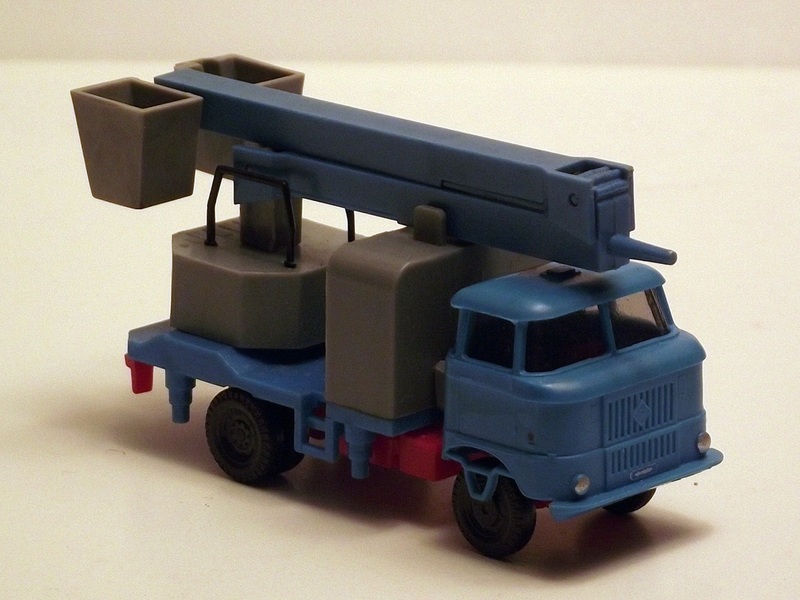 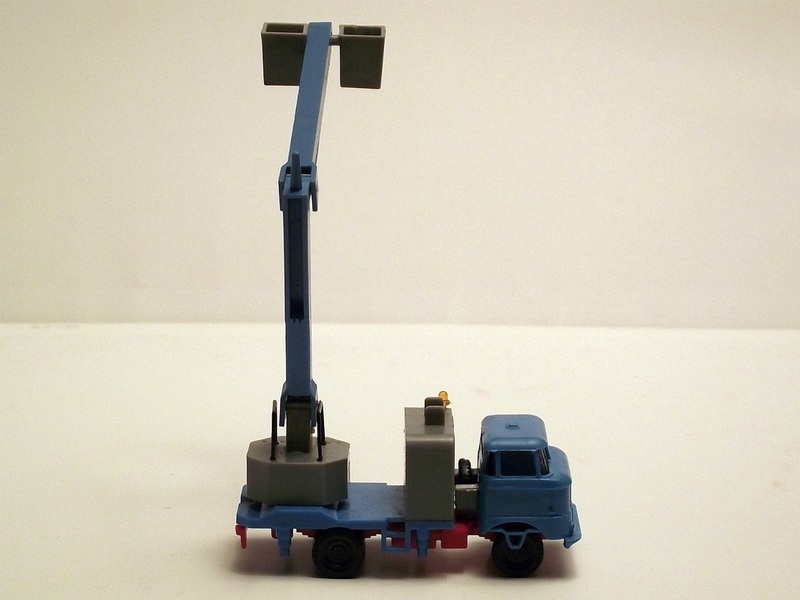 It is a plastic model with a crane that can be extended and rotated. As a 1:87 scale model it fits perfectly to the HO size model trains made by PIKO Germany. 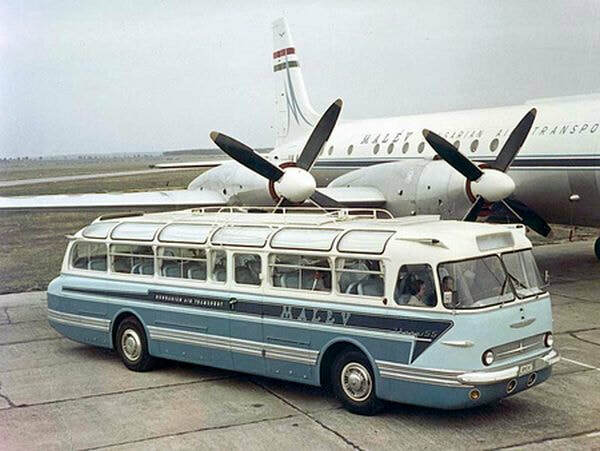 The IKARUS 66 is a city bus made by Hungarian manufacturer IKARUS from 1959. 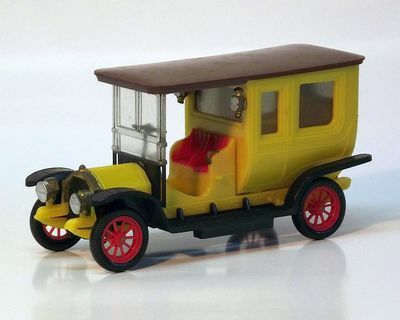 IKARUS was established in 1895 as Uhri Imre - Kovács és Kocsigyártó Üzeme (roughly: "Imre Uhri's Blacksmith Workshop and Coach Factory"). 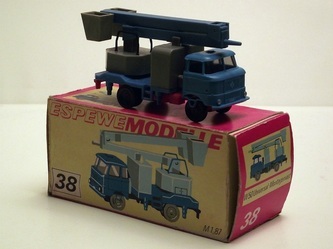 This is a 1:87 scale plastic model made in east Germany by ESPEWEMODELLE. 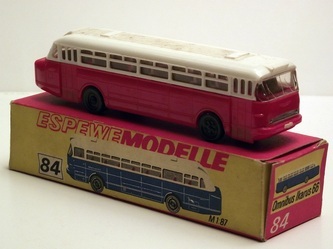 It was No.84 in the series and a perfect match for HO size model trains. 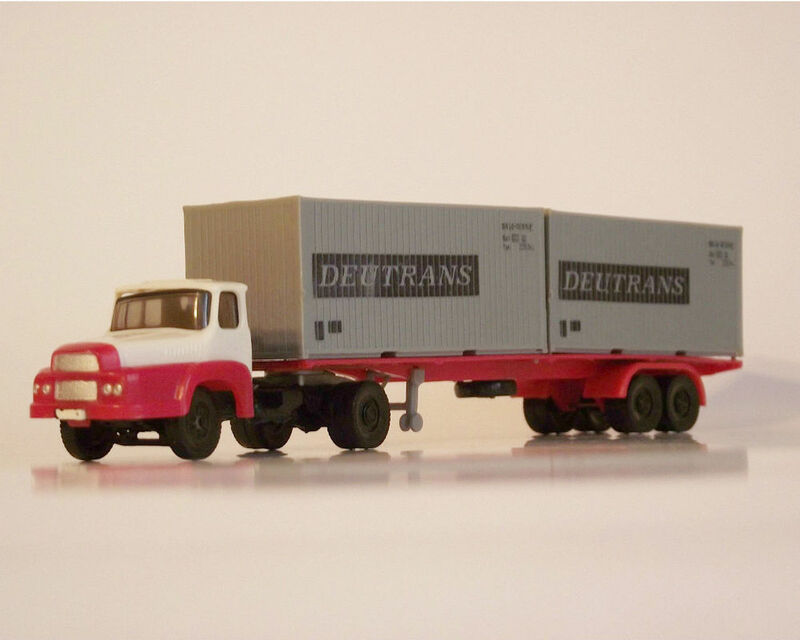 It was produced between 1968 - 1979 in various colour combinations. The truck used for this airfield fuel tanker was the multipurpose Mercedes-Benz L 1924 model. 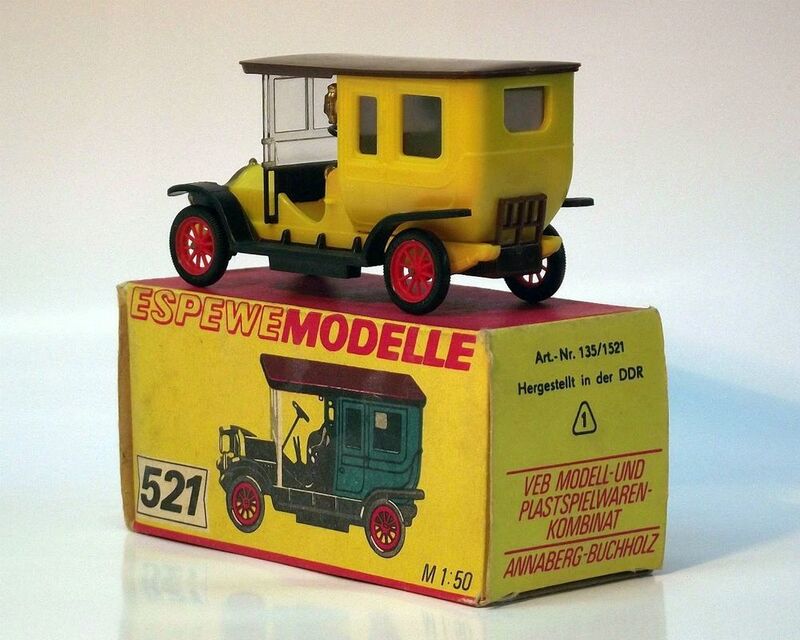 This is a 1:87 scale plastic model made in east Germany by ESPEWEMODELLE. 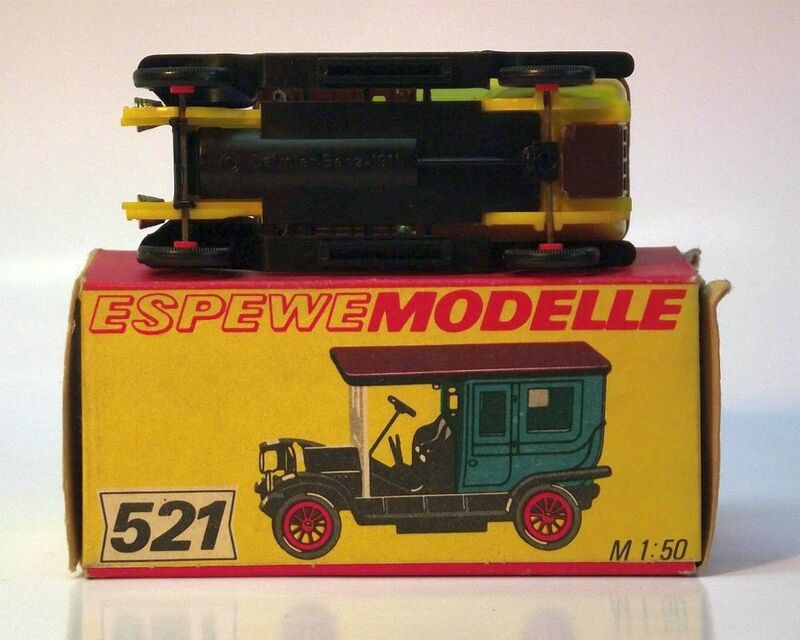 It was No.45 in the series and a perfect match for HO size model trains. The tank can be separated from the truck and the side doors for the compressor control can be opened. 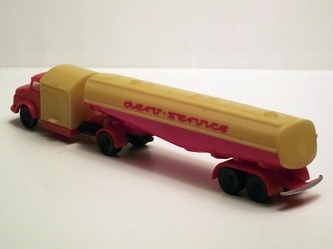 This was manufactured between 1966 - 1971. 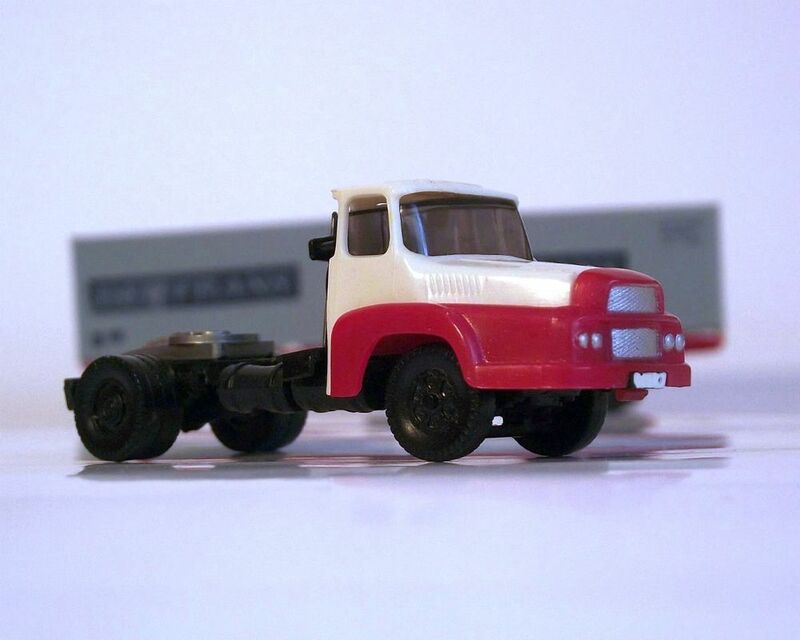 Perlini is an Italian truck manufacturer. 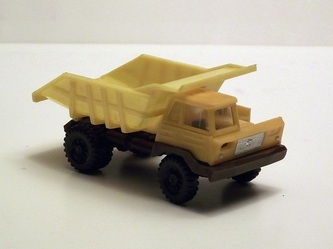 They still manufacture large dump trucks. 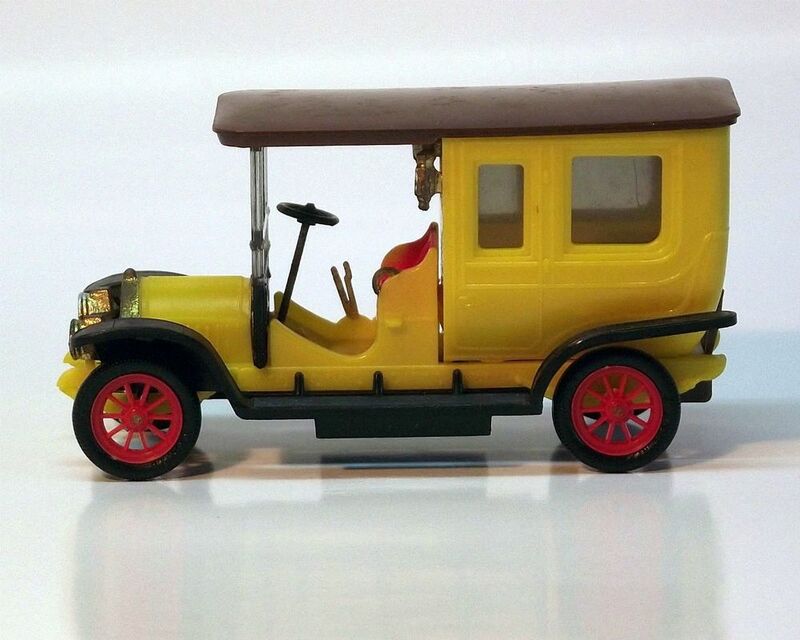 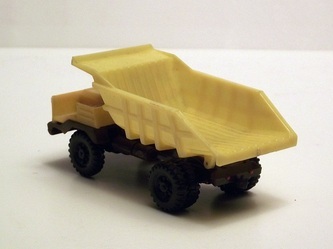 This is a 1:87 scale plastic model made in east Germany by ESPEWEMODELLE betwenn 1978 - 1990. It was No.47 in the series and a perfect match for HO size model trains by PIKO. 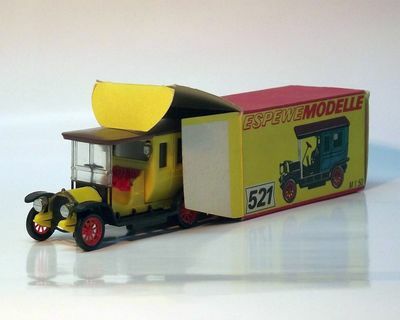 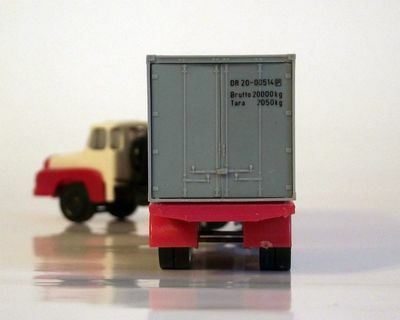 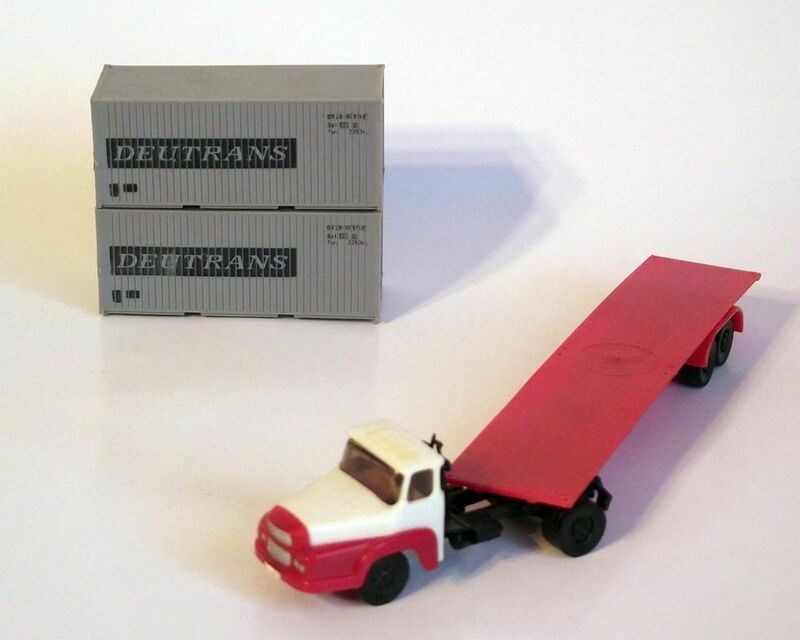 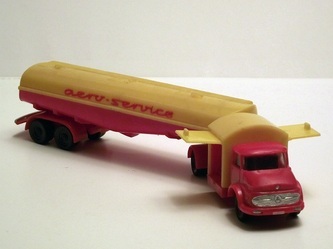 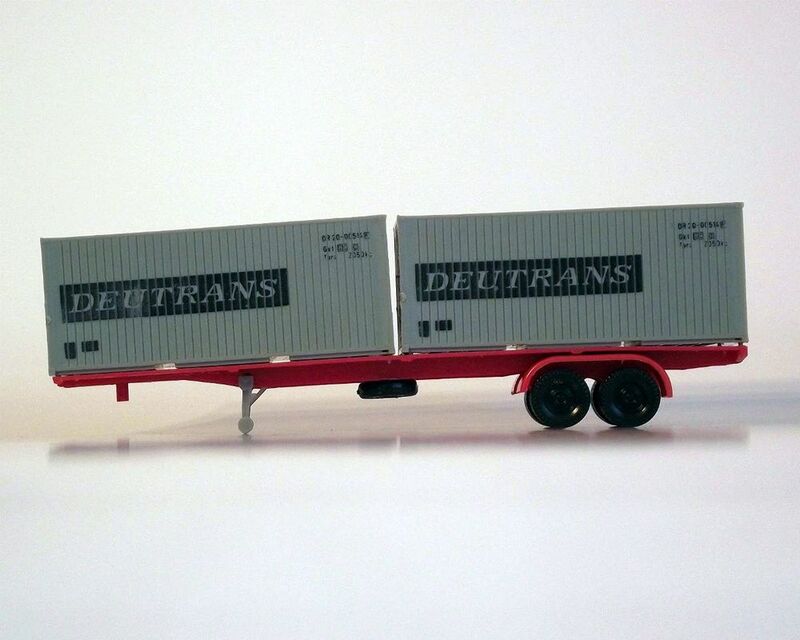 The Espewe Modelle 49 scale model is a fully plastic semitrailer container with detachable tractor and removable containers. 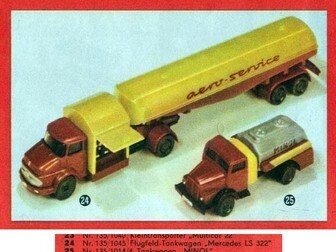 The tractor is a UNIC Izoard but this is nowhere mentioned on the box and as a kid I never knew this. 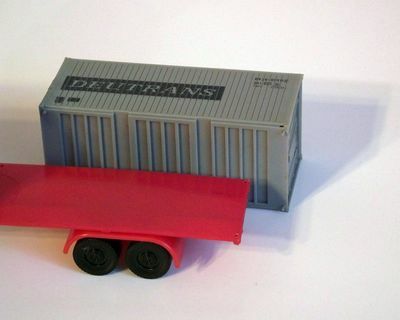 The containers have double articulated doors and can be stacked with the help of small pins located at the bottom of the container. The detachable tractor is interchangable with the tractor from the Espewe Modelle 45 shown above. 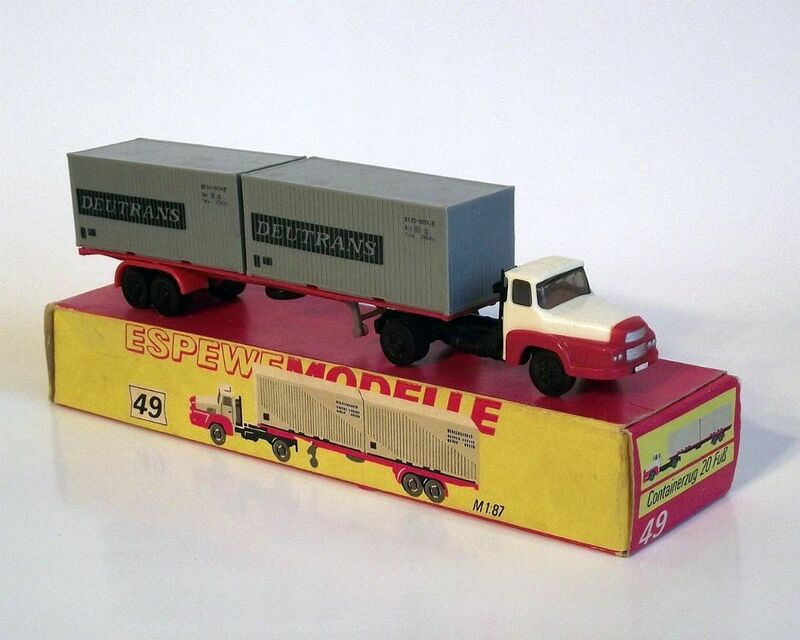 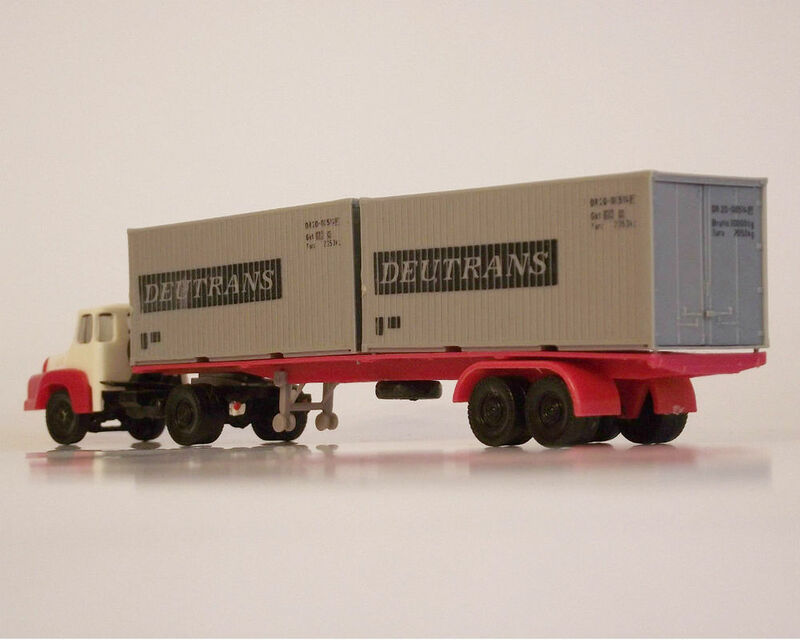 Scale is 1:87, a perfet match for the HO scale model trains manufactured in the former East Germany by PIKO. 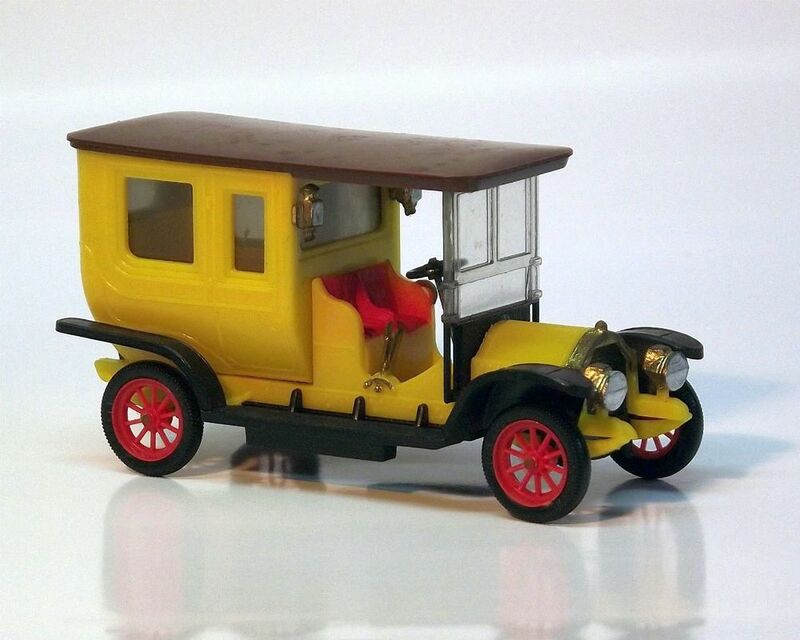 Part of a small series built at a scale of 1:50 this is a plastic scale model of a OLDTIMER DAIMLER BENZ 1911. 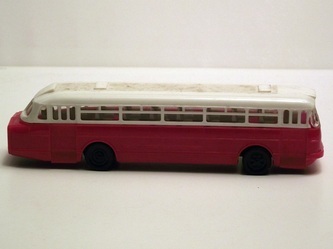 It's a 85 mm long model, made in several colours (white, yellow, red, orange, green) with black fenders, bronze coloured details (headlamp, radiator grill) and transparent windshield. 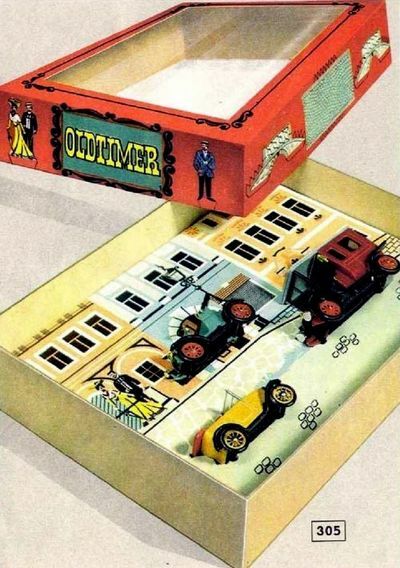 Full catalog number is 135/1521 with 521 printed large on the box. 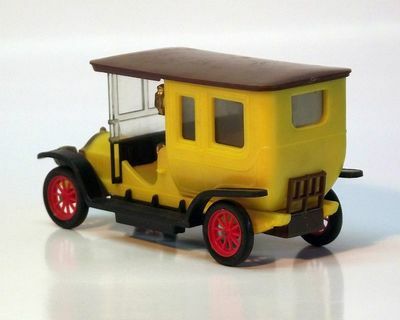 According to a 1968 ESPEWE MODELLE brochure this is the scale model of a Mercedes 14/30 but the model is marked "Oldtimer Daimler Benz 1911" ​This model was also available as part of a "Giftpackage" but these were strangely built to a scale of 1:87 instead of 1:50. It seems that there were two production runs, one from 1968 to 1978 and another one between 1988-1990.